Synopsis: This will encourage the reader to develop discipline and clarity about why they are on the journey they have chosen. 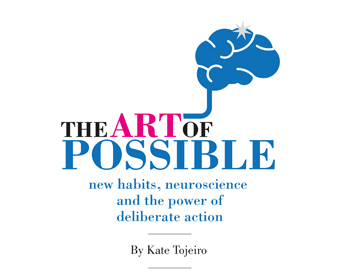 A new book, The Art of Possible, has been published to help everyone to understand how the brain works using the latest findings of neuroscience, in order to recognise what is really possible in their everyday life and develop the “can do” attitude required to achieve goals, faster. The author, Kate Tojeiro, is an executive coach and facilitator to senior executives in some of the world’s largest organisations, such as Google, Accenture, Rio Tinto and Barclays. Kate is the founder of leadership development firm X fusion, and has formed a reputation for developing some of the world’s most successful leaders, as well as the next generation of rising stars. This approach to developing innate confidence and an attitude to “get things done” has proved equally valuable in people’s personal and professional lives. The Art of Possible is structured in a way that provides questions and techniques that encourage the reader to develop discipline and clarity about why they are on the journey they have chosen, enabling them to train their brain and get the results they want faster than ever before. The book draws on Kate’s own experience and expertise, the latest in neuroscience, first-hand experience with global leaders to interviews with elite sports people to outline exactly how anyone can realise their full potential. Inspiration for The Art of Possible came after Kate watched Ewan McGregor and Charley Boorman’s three month trip in Long Way Round and decided to sign up for her own off road motorbike challenge across the Pyrenees to raise money for two children’s charities. The problem was that Kate was a novice motorcyclist, and had not really ridden very much until nine months before the challenge, so during what quickly became the most physically and emotionally grueling experience of her life, she learned that when you overcome something scary, it can turn the feared into something brilliant, a changed life.